img. ICON Institute of Conservation website. 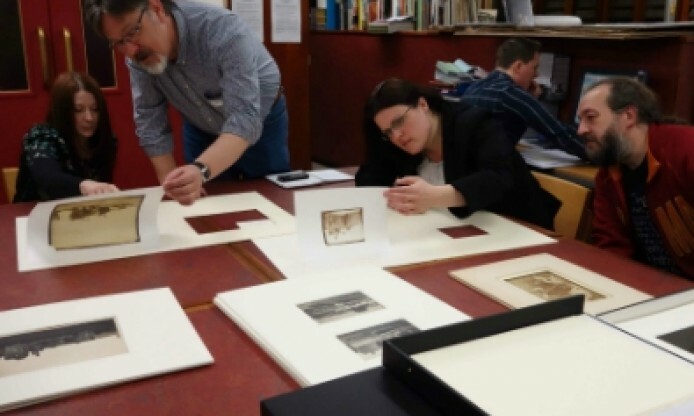 Following the success of last year’s event, the Icon Photographic Materials Group is running a second photo conservation round table on Friday 30th November at the Science Museum, London. This event aims to promote collaboration and knowledge sharing among conservators and other professionals interested in the preservation of photographic materials. The PhMG is looking for conservators, conservation scientists, students, and anyone else keen to speak about photograph conservation. Whether you’re working in a public institution, as a private conservator or in academia, we’d love to hear about your work and experiences. We’re hoping to cover a range of issues and solutions involving both traditional and modern photographic materials through treatment, preventive measures and research. This will be an informal event, aiming to create a comfortable space to discuss photographic conversation. If you are interested in giving a five-minute presentation, please send a titled proposal (c.100 words) with your name and affiliation to phmg@icon.org.uk by 2nd November. Presentations should include approximately five PowerPoint slides, which should be illustrative rather than textual. If you’d like any further details or to discuss your idea, please get in touch as soon as possible. We look forward to hearing from you! The event will take place between 13:00 and 17:00. Tea, coffee, soft drinks and biscuits will be provided. The round table will be followed by the Icon PhMG Annual General Meeting, which is free to attend. You do not need to give a presentation in order to attend. A final version of the programme will be available on 12th November, though you can check our Eventbrite page for updates before then. Thank you to the Science Museum for hosting the event.